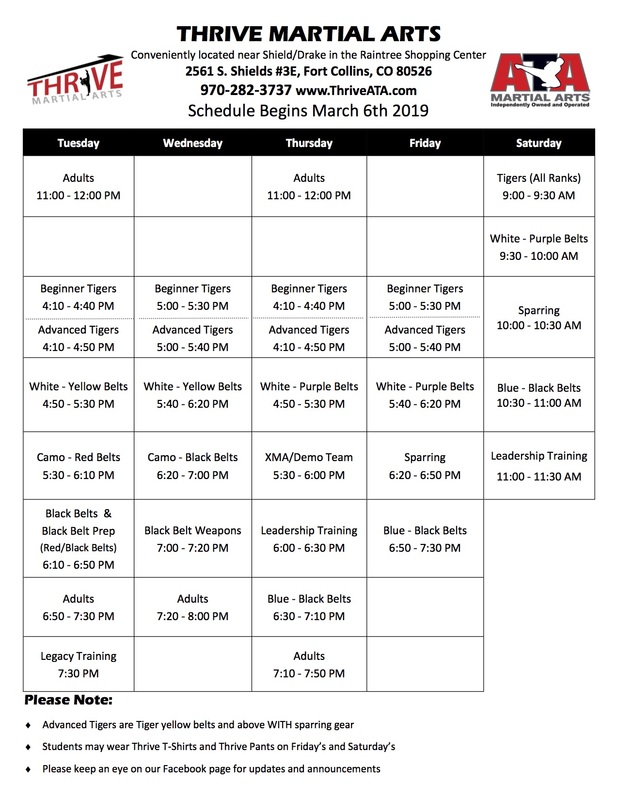 For years, Thrive Martial Arts has been serving the people of Fort Collins with our high-quality martial arts classes. Located in the Raintree Village Shopping center off Shields and Drake, we’re in an easily accessible location and we’re happy to accommodate any potential student in the Fort Collins area, be it little tikes, children, or teenagers and adults. 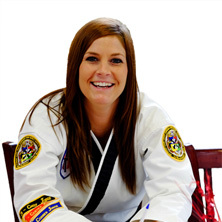 Self-Defense: In each of our programs, we teach taekwondo in accordance with the American Taekwondo Association (ATA). The intensity of the training is tailored to each age group, being fairly basic for our “Tiny Tigers” aged 4-6, and more realistic and advanced for our adult students. 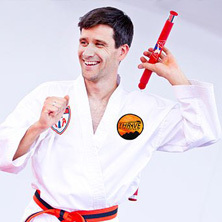 Athletic Development: Taekwondo is quite a workout no matter what your age is. Keep your kids’ bodies and minds healthy by enrolling them in classes, or sign up yourself to guarantee that you’ll always have something in your life that keeps your body moving. 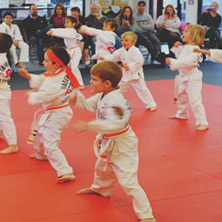 Socialization: Martial arts classes are excellent for children to learn valuable social skills, such as learning from authority figures, and creating relationships with peers. Adults and teenagers are also able to meet like-minded people and form friendships. Mental Training: Martial Arts helps one to improve their mental discipline. Our taekwondo “forms” (a memorized, sequential demonstration of various karate techniques) require students to practice outside the dojo and commit moves to memory. Life Skills and Values Development: Martial Arts have traditionally endorsed a moral and ethical lifestyle. 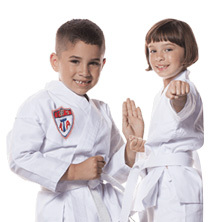 If your child takes classes at Thrive Martial Arts, they will be taught positive values. Kids in middle childhood (6-12) also have the opportunity to enroll in our Leaders THRIVE program, which teaches valuable leadership skills. Thrive Martial Arts is the Top Rated Local® Martial Arts Studio in Fort Collins and Loveland. Contact us today to inquire about enrolling in our classes, or sign up for our free trial to see if martial arts is right for you! Ready to Start Your Trial?Sign Up Now! ©2018 Thrive Martial Arts® - Do not copy. All rights reserved.